Mt. Waas is the highpoint of Grand County, UT and the 4th highest summit in the La Sal Mountains, Utah's second highest range. Like the Tushar Range I'd visited earlier, the La Sal Mtns rise like an island above the deserts of the Great Basin, an oasis of conifers and alpine zones in the cooler temperatures found thousands of feet higher. On my way across the western US to Telluride, CO, I was taking my time, spending a week doing some peakbagging in Nevada and Utah mixed with the driving. I had spent the night parked at the highpoint of the La Sal Loop Rd above 8,000ft, reasonably cool compared to the 100F+ temperatures below in Moab. A short distance to the east is the Forest Service road leading to Miners Basin on the west side of Mt. Waas. This rough dirt and rock road is far too much for my van, so it was necessary to park at the pavement at the start of the road and hike the three miles to almost 2,000ft higher, an effort that took me an hour and a quarter. At the TH, maintained trails head off in two directions, neither one going particularly near Mt. Waas. The northern fork goes over a saddle NE of the trailhead before descending north to Bachelor Basin. I would use a portion of this trail for the return. The southern fork which I started on goes over a saddle to the south before continuing for a number of miles to Geyser Pass Road. Fortunately, an old mining road that forks soon off this second trail is still serviceable and it is this road that is described in most of the reports originating from Miners Basin. Though unsigned and somewhat overgrown initially, I had little trouble locating where to turn off to find this road (having it marked on the GPSr helped). It makes for a pleasant hike through forest and meadow, eventually opening to views in the higher reaches. I spent about an hour and a half from the TH to reach the main crest of the La Sals from where one can first glimpse Mt. Waas about half a mile to the northeast. The lush green of the last previous few thousand feet gives way to windswept rock with just a thin layer of patchy green grasses and flowers covering portions. I turned south and paid a visit to Pilot Peak first, a ten minute walk from the saddle I had reached from the old road. There is a fine view of nearby Manns Peak to the southeast as well as the higher summits of the range around Mt. Peale some six miles to the south. I considered briefly a visit to Manns Peak only a mile away but decided against it in the end (afterwards I regretted this decision some since it would turn out that I had plenty of time). Instead I turned north, returning to the saddle and then onwards towards Mt. Waas. 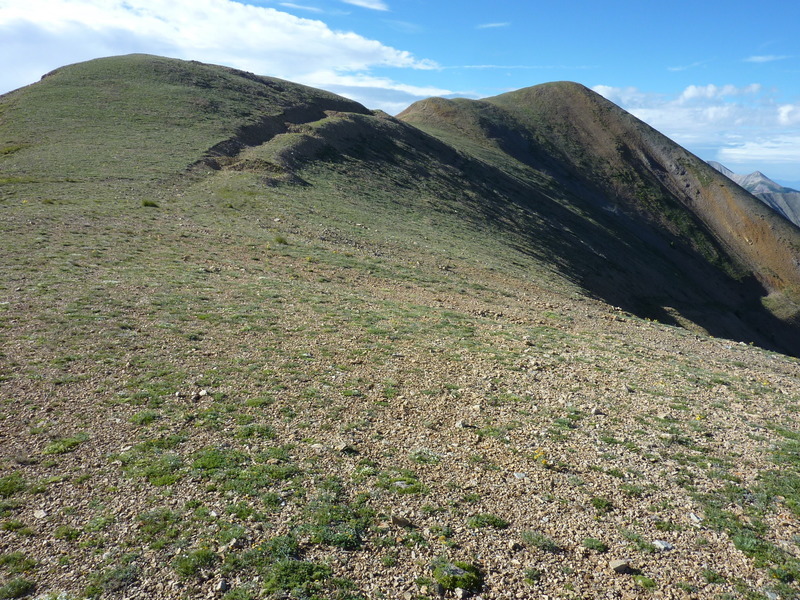 I first went over a minor intermediate highpoint at 12,163ft before descending the NE Ridge to a saddle with Mt. Waas. Here I found a series of helpful switchbacks leading steeply up through the talus to the summit. It was odd because I saw no sign of a trail leading down from the saddle - just those switchbacks leading 500ft up to the summit. The trail disappeared as the steep section rolled off to the rounded summit, leaving an untidy pile of rocks to clamber over towards the highpoint. It wasn't obvious which of several possible locations might be higher due to the flatness of the summit area. I did find the Waas benchmark, but no sign of a register. A rock windbreak had been constructed for camping near the summit (am I the only one who finds these highly annoying?). Not yet 10a, I decided I had plenty of time to head north off the summit and visit two nearby 12ers in that direction, Castle Mtn and La Sal Peak. I found remnants of another use trail through the talus on the north side of Mt. Waas though it was less distinct than the one I'd used on the ascent. A better use trail is found heading up the SE Ridge of Castle Mtn though it ends before reaching the top - maybe some of these are old mining trails leading to prospects near the summits? It took 30min to travel from Waas to Castle and another 20min to reach La Sal Peak. At 12,001ft, La Sal is the lowest of Utah's 89 12'ers. After reaching this last summit before 10a, I realized I had plenty of time left for a bit of adventuring. Rather than return back via the straightforward route down Miners Basin, I decided to explore the cross-country route off the northwest side in order to reach the trail leading to Bachelor Basin. This involved a 2,000-foot, mostly scree descent, some of it unpleasant but nothing harder than steep class 2. I hadn't realized the west side of La Sal was fraught with cliffs but the chute I descended, while not all that fun, at least descended through the cliffs without running into trouble. At the end of this talus I descended a portion of a creek through modest brush and forest before enduring yet more talus until eventually finding the trail in the forest. I turned left and followed this back up for 700ft to a saddle with Miners Basin before dropping into the later. Portions are signed as the Trans-La Sal Trail which I think is the same as the Bachelor Basin Trail. In any event, I followed this back down to the TH at Miners Basin and then for the final three miles back down the road to the pavement where I'd parked my van. I always thought this range looked so wild and foreboding from Arches NP.